Welcome to Halloween Express Quad Cities! We are in Moline IL for the 2016 Halloween season. We will once again be carrying the largest selection of Halloween merchandise you'll find anywhere in Quad Cities area. 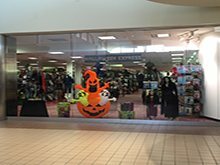 We have two huge Halloween stores this year at the malls in Moline IL and Davenport IA. If you are looking for the newest and greatest you can find it at Halloween Express! Stop by our location in the South Park Mall by J C Penny or in the North Park Mall across from Claires. We are locally owned and operated. Checkout our Facebook page for exciting new Halloween merchandise and special sales. Halloween Express Quad Cities.